Choice MedWaste is a one stop shop for all your medical waste disposal needs. If you do need some help with other waste disposal (hazardous or solid), we can point you in the right direction as well. We personally handle your sharps, chemotherapy, regulated medical, pathological, pharmaceutical and dental amalgam waste streams. When working with our team, you will experience a more customer focused business philosophy. Whether your facility is right in our backyard, Sussex County, Montgomery County, Lancaster County or any other counties we service, you will always be treated as a valued and important part of the team. We will work with you in order to provide the best medical waste disposal solutions for your facility. That can be anything from pharmaceutical disposal to dental amalgam waste disposal. We can customize service frequency, service type, training needs, etc. so you get exactly what you are looking for. Creating a two-way relationship seems like common sense; however, most companies do not exceed expectations when supporting their customers. With our flexible contracts, we will earn your business every month rather than locking you into services. 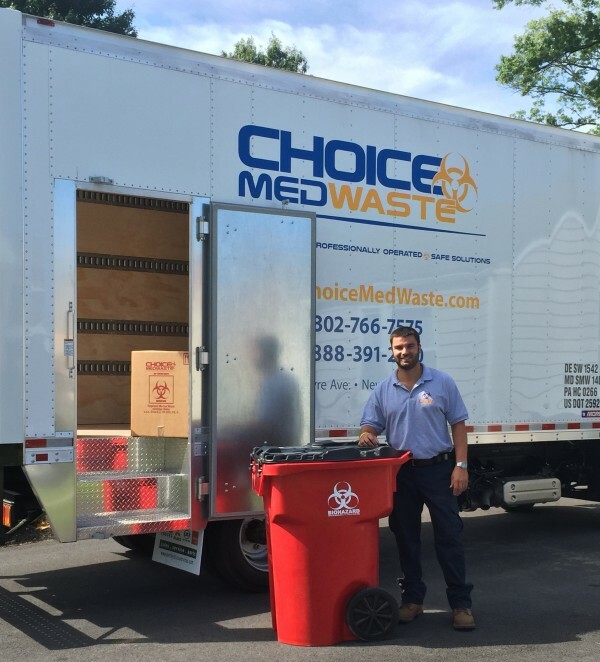 Our responsive team at Choice MedWaste is always available directly through our office or through Matt’s cell phone. You will never get an electronic call service prompting you to jump through hoops to get a real person on the phone. In addition to our standard infectious waste removal, Choice MedWaste is an expert on Amalgam Disposal options for our dental facilities. We sell Dental Amalgam Waste Containers, Dental Amalgam Separators (that every dentist in the United States will need by 2020), and even Tooth containers nationwide. We can ship to anywhere in the United States. Reducing the mercury entering our water systems is a top priority of Choice MedWaste and we look forward to providing these amalgam disposal services to our customers in Lancaster & Bucks County, Wilmington, Delaware, Dover, Delaware, Newark, Delaware and beyond. Call us today to find out what is best for your dental facility! Customers have voiced their approval of our services and we are happy to provide references if needed. We have plenty of customers in Newark, Delaware and Dover, Delaware that will provide examples of the little things that differentiate us from our competitors. We promise to put your interests first by exceeding your expectations of how a medical waste disposal company should act. Please give us a call! If you are in our neighboring Pennsylvania counties (including Montgomery County, Bucks County, Lancaster County, Philadelphia County etc. ), Maryland Counties, or all of Delaware, we will be happy to meet with you in person to introduce our company and business philosophy to you. We strive to be your number one call for medical waste management solutions. Hospitals, Doctors, Nurses, Tattoo Parlors, Veterinarians, Labs, Funeral Homes, Barbershops, Dialysis Clinics, Blood Banks, Surgery Centers, Research Facilities, Walk In Clinics, Barbershops and any other industry dealing with blood related articles.